Type and Use: Tender perennial with edible rhizomes (hands). It can be used in tea and in many food dishes. Chewing raw is another use. Location: Sun to partial shade. Semi-shade is best. Planting Dates: Indoors or in greenhouses any time. Outdoors in the spring after the soil has warmed and all danger of frost is gone. Planting Method: In the fall, buy the rhizomes (hands) and cut them into pieces about the size of half a golf ball. Cover the cut surfaces with fireplace ashes or soft rock phosphate (available from garden centers on newspaper or butcher paper in a cool, dry place until the cut surfaces form a callous. I’ve learned the hard way that if you plant without taking this step, the pieces will rot in the soil. Place the callused ginger pieces in the soil at a planting depth so shallow that the pieces still show above the soil line. I use 6-8 inch clay pots. Put the pots in a sunny spot. They can be left outdoors while the weather is still warm but must go inside during cool nights. Bottom warmth from commercially available heating devices helps to speed up the sprouting. Remember this is a tropical plant and must be kept warm in a brightly lit spot all winter. In the spring, after all danger of frost has past, the young ginger plants can be moved to larger pots and placed outdoors or planted in garden beds. Harvest Time: The following fall before temperatures fall below 50°. Growth Habits: Beautiful tropical plant with yellow and purple flowers that bloom in late summer and are fragrant. Upright, jointed stems that are similar to bamboo. Culture: Gingers are heavy feeders, so add organic fertilizers at least three times a year. Healthy, moist soil is needed and regular foliar feeding with Garrett Juice is important. Some of the large ornamental ginger can be cut back in fall and mulched heavily to encourage them to live through the winter, especially in the lower half of the state. Troubles and Solutions: Freeze damage in most of the state. Z. officinale is particularly freeze-sensitive. Harvest and Storage: Dig the rhizomes in the fall and store in a cool dry place for use in teas and foods. Notes: Ginger often prevents motion sickness. Growing and using ginger is good for the kids and adults. It is also an important antioxidant. All ginger roots are edible especially if they have been grown organically. 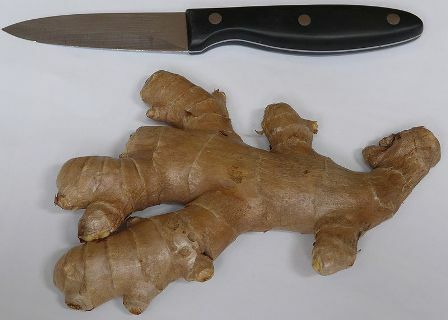 Most of the ginger that is specifically grown to produce the edible tubers are tropical and freeze easily so plan on digging them carefully before the freezing weather starts. When planting ginger from a hand, cover the ginger cuts with soft rock phosphate or fireplace ashes. Let the pieces callus over before planting them at the surface of a good organic potting soil.